Cafe Coffee Day, Opposite Dolmen Mall, Tariq Road, Karachi. Karachi Tips T-Shirts ARE FINALLY HERE!! Due to huge response and great demand, Karachi Tips now brings you Karachi Tips T-Shirts. We've loved the pride, we've loved the city, we've loved the tips. It's time to wear them and show off the awesomeness of Karachi like never before! 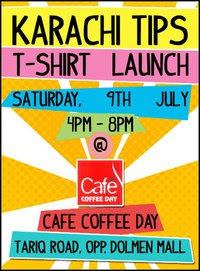 KarachiTips invites you all to the T-Shirt launch event. Cafe Coffee Day, Opposite Dolmen Mall, Karachi. Joining us at the event will give you a chance to meet up with the admins and get to know what goes on behind the scenes! You can buy the special edition Top-5 T-shirts available ONLY at the launch and pre-orders. We'll be giving away tons of free merchandize. A lot of media representatives and celebrities will also be invited. We’re already in negotiation with TV and Radio channels for coverage and sponsorship. If you're a Karachi-based talented singer/songwriter, you are most welcome to perform. Send us a video and we'll endorse you here! You can perform at the event and earn your fanbase. We can also add your page as our favorites. Get in touch! There’d be music, coffee, chit-chat and chill-out time. The returns of this event will be used to support youth of Karachi. If you or any one you know runs a charity organization, is doing genuine work and can use some donations, please stop by and meet up with us. If you are an artist/filmmaker, we are also looking to support short films and documentaries related to Karachi. If you have a sparkling idea and need support, we will be glad to help. Designs of the T-shirts will be put up on Sunday and we’ll start booking orders. Booked orders can be picked up on the event or can be delivered, depending on the customer’s preference. Please remember this is all in the good spirit of promoting positive Karachi. If you think our city is worth it, please come and be a partner in cause.